The General Services Administration (GSA) is an important part of the government contracting process. It is actually an independent agency that helps the U.S. Government to operate seamlessly by providing it with the products, office space, and transportation it needs. Federal contractors rely on GSA Schedules to serve as a communication system that tells the general public which goods and services the government needs, and vendors respond by submitting their bids. In order to succeed as a federal contractor, you have to understand cost loading - how to calculate your costs per unit (i.e. for a slice of pie, versus a whole pie) and how that cost factors into your pricing strategy. Without knowing this, you can win a federal contract only to find you can't deliver on the contract. Not without putting yourself out of business. We strongly recommend your complete the Pricing Strategy Clinic BEFORE completing this class. 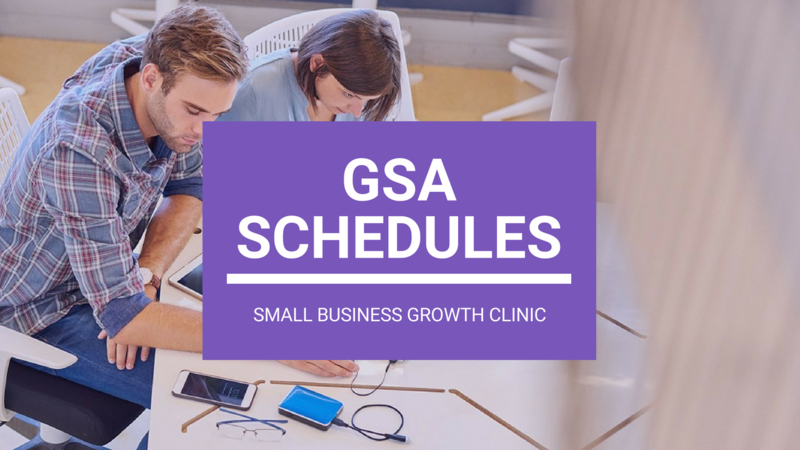 In this hands-on clinic, you will go through the GSA Schedule and find live RFPS that would be a good fit for your organization, and provide you with a strategy to respond to, manage, and leverage GSA Schedules to grow your business. If you have already bid unsuccessfully on a RFP, bring it. We can review your bid and tell you where your proposal fell short. Keep an eye on your inbox to find out when the next GSA Schedules Clinic will be.